Eastern National Site Manager Rose Fetty (in white shirt) assists customers at the EN store in Homestead National Monument of America’s Heritage Center during the total solar eclipse event. Homestead National Monument of America’s event to celebrate the “Great American Eclipse,” held August 19 – 21, 2017, was a resounding success on many levels, with approximately 30,000 people visiting the park. Over $75,470 in sales for the weekend helped Eastern National eclipse both the sales budget for fiscal year 2017 and the sales records of the same month in previous years. Thanks to the sales boost from this event, this EN site has had a whopping 198 percent increase for the year and a 756 percent increase for August compared to last year! 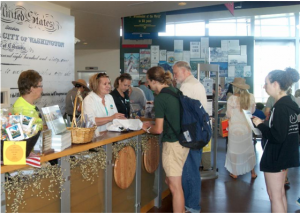 In addition to the existing Eastern National stores in the park’s Education Center and Heritage Center, EN staff operated an outdoor sales tent. Southern Regional Manager Helena Adcock and Acting Midwest Assistant Regional Manager Emily Rapp were on hand to assist Site Manager Rose Fetty with top sellers including EN custom-made and eclipse-themed items such as T-shirts, posters, postcards, pottery mugs, blankets, pins, ornaments, and hiking medallions. EN’s newly published park handbook, Homestead National Monument of America: In Search of the American Dream, also debuted as a sales item. Additional support to the event was provided through an Eastern National Competitive Grant of $10,000. 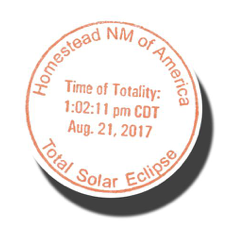 Also in honor of the solar eclipse, special-edition “Time-of-Totality” Passport To Your National Parks® cancellation stamps were available at National Park Service sites located within the shadow of totality. These stamps were offered at the following NPS sites in order of totality: John Day Fossil Beds NM, Craters of the Moon NM & PRES, Grand Teton NP, Fort Laramie NHS, Agate Fossil Beds NM, Scotts Bluff NM, Homestead NM of America, Harry S Truman NHS, Ulysses S. Grant NHS, Fort Donelson NB, Stones River NB, Obed WSR, Manhattan Project NHP, Great Smoky Mountains NP, Blue Ridge Parkway, Ninety Six NHS, Congaree NP, Charles Pinckney NHS, and Fort Sumter NM. 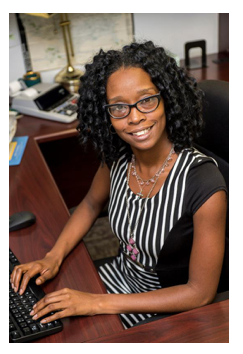 Carica Williams has recently joined Eastern National as office administration manager. In this position, she is responsible for day-to-day office management and administration operations for EN’s Headquarters office. Carica has over 10 years of experience in office and administration management. Prior to joining Eastern National, she was a corporate office manager in the healthcare industry. Her skill set consists of contract management, facility coordination, and developing key processes. With a heart for outreach and volunteerism, Carica commits at least three hours a month to service. She enjoys good food, cooking, traveling, and watching HGTV. Above all, she loves writing and defeating her daughter in Monopoly or Just Dance. With support from an Eastern National Competitive Grant of $3,584, Lincoln Home National Historic Site was able to secure the services of a Teacher-Ranger-Teacher to create curriculum-based programs on the history and cultural resources of the park. 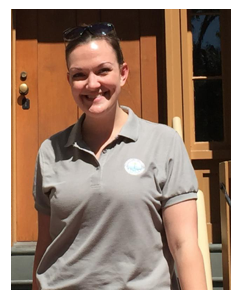 Local educator Jenna Glore from Riverton Elementary School was selected as the park’s Teacher-Ranger-Teacher and has worked effectively to support the park’s first participation in this nationwide program. She spent several weeks this summer at Lincoln Home National Historic Site producing three educational lesson plans and supporting materials. These lesson plans will be available for use by the approximately 29,000 students who annually visit the park. Visit here for additional information about our funds at work. Every once in awhile, a famous face stops into one of our stores on a visit to a national park, which creates quite a flurry of excitement! 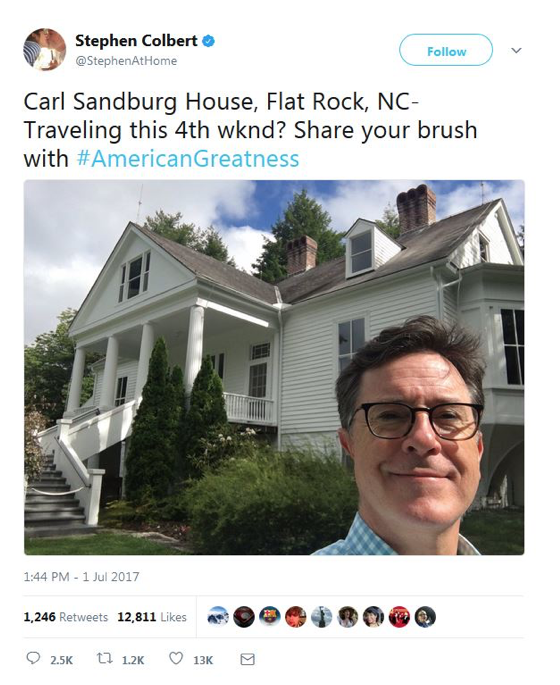 On July 1, just before the July 4th holiday, Stephen Colbert and members of his family visited Carl Sandburg Home National Historic Site. They took a tour of the site and did some shopping in the Eastern National store, where EN Site Manager Jane Grossman assisted them with a purchase. Jane learned that this was Mrs. Colbert’s second visit to Carl Sandburg Home, and this time, she brought her family along to see it as well.